The recent winter storms that hit the Sichuan Province of China knocked the power out at the Wolong Panda Center at Gengda. While the pandas LOVE the snow and cold weather with their nice heavy coats, the keepers have no such luxury. The Panda who Faked her Pregnancy…or Did She? The National Zoo sponsored a trip to China in September 2008 and I was fortunate enough to go on it. Initially we weren’t sure that we would even be able to see pandas on the trip because of the devastating Wenchuan earthquake that struck in May 2008, but we did. We were one of the first groups of tourists who visited the Sichuan area and we spent an awesome day in Bifenxgia. One of the highlights was being able to spend time in the panda kindergarten. I decided to stay near one panda (although there were several to play with) and afterwards I asked the keeper to write down her name for me, Xin Nier. This is a photo of us in the panda kindergarten as well as a photo of her after she ate – a bit messy, I’d say. 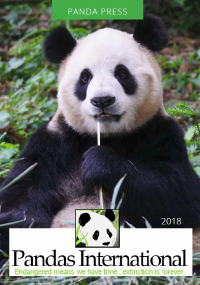 When I got back to the states, I realized that I could “adopt” her through Pandas International and have been renewing the shared adoption since that time. It is my special Christmas present to myself. I was able to go back to Bifengxia in 2010 on a trip sponsored by Pandas International – this time it was to volunteer with the pandas at Bifengxia. I asked the folks at the Wolong Panda club office if there was any way that I could volunteer to clean and feed Xin Nier, or at least spend time with her. Her keepers said that was fine so I was thrilled to spend the day with her (and her roommates). I wanted to spend as much time as I could watching her and I did that in my spare time on the third day. I just hung out and watched her and her roommates interact and of course, eat bamboo. I have to laugh because every update that I’ve received has had comments on how much she likes to eat – that didn’t change at all. Someday I hope to go back to see her again, but until then I excitedly keep an eye out for photos and updates on how she is doing. Pandas aren’t as picky as we thought: Researchers find endangered animal is far more adaptable (as long as they’ve got bamboo) Had been believed animals needed pristine forest with a gentle slope Team now say animals simply want to be where the best bamboo is By MARK PRIGG FOR MAILONLINE ORIGINALLY PUBLISHED: 16:56 EST, 4 December 2014 | http://www.dailymail.co.uk/ Pandas are not quite as picky as experts thought. Researchers in Michigan say that in fact, animals are far more resilient in the areas they can live in. The new finding could dramatically improve the animals chances in the wild – where the 1,600 remaining wild giant pandas in the 21,300 square kilometers to which the animals have been relegated. Panda Fact Friday | How do Pandas Survive the Cold Winters? Panda Fact Friday | How big is a Giant Panda? Panda Fact Friday | How Long do Pandas Live?